flying a Sea Harrier from H.M.S. Invincible on May 21, 1982. A pilot's eye view of the last seconds of a Mirage V at the hands of 801 Naval Air C.O., Commander 'Sharkey' Ward, flying a Sea Harrier from H.M.S. Invincible on May 21, 1982, in a ferocious dogfight during the Battle of Falkland Sound. 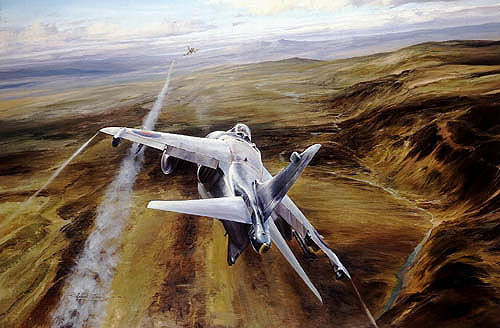 me over that Falklands landscape. My congratulations"